Imagine a beautiful house set in 50 acres of greenery. Now add a verandah, a loft bedroom, a dining area that’s surrounded by forests and all of this tucked away from the maddening crowds. This is what Greenaway is all about. 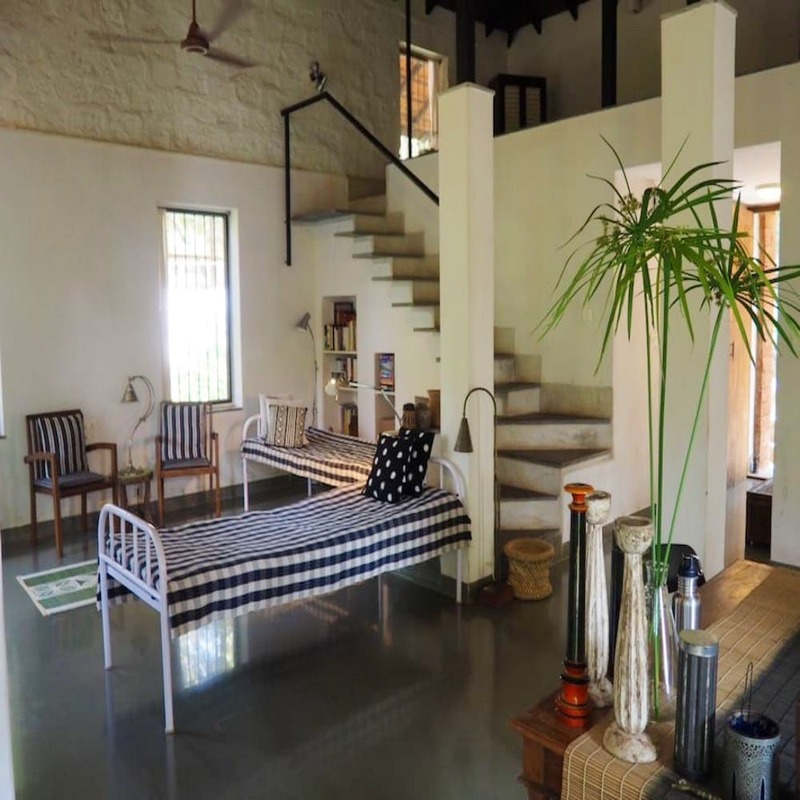 Located near Siolim, they call themselves a forest escape. Set in wilderness but not too far from civilisation makes this house-for-four a good option for couples and families. Vagator, Ashvem, Morjim, Anjuna and other beaches are about 30 mins drive while the local Mapusa market is barely 15 mins away (want to pick up Goan spices or fresh fish or bibinca?). So, whether you seek quiet to practice your morning yoga or to recover from all that partying on Morjim beach, this place is perfect. With two single beds on the ground floor and a double bed in the loft, the host couple have made good use of the space. For INR 8k a night and the prospect of cycling through the forests or going hiking and getting breakfast, we don’t think this is a bad deal if the tariff was split between a group. Do the math, guys. Need more convincing? Well, this tastefully done bungalow is an Instagram dream and it’s easy to see that a lot of thought has gone into handpicking every element. The open kitchen, for instance, is a cosy nook with a dining table so everyone’s free to talk, lend a hand and enjoy meal-time as a family activity. While you’re chilling in the house, you also realise how much of the green space is constantly surrounding you. Like they said, it’s really an escape. The loft bedroom with its bare white walls is such a serene space to catch up on some reading or cosy up with bae. We love the stark nature of this loft for it reminds us of the hills. Truth be told, it's this feeling of warmth that draws us to this place (you'll be reminded of Ruskin Bond's stories) instead of one of those typical villas close to the beaches. Since the whole approach is to be in the midst of nature, there’s no air-conditioning. They have huge doors and windows with a mesh and grill to keep you breathing fresh forest air. If you’re worried you’ll be inconvenienced because of this, several other villas await. If you’ve hired a vehicle to go around Goa, you’ll be happy to know they have parking space.